One of the most confusing generic names to any gardener is Geranium. Anyone familiar with temporary planting schemes will know the popular Bedding Geraniums. This is the rather misleading common name for hybrids of the genus Pelargonium (mainly derived from Pelargonium zonale). To distinguish them true Geranium are often called Hardy Geraniums. Most species and hybrids of true Geranium are able to tolerate several degrees of frost and therefore can live outside all year round, even in cold climates. So you cannot talk just about a geranium, you have to clarify whether you mean a Bedding Geranium or a Hardy Geranium, i.e. Pelargonium or Geranium respectively. Fortunately, the two genera are quite easy to tell apart. 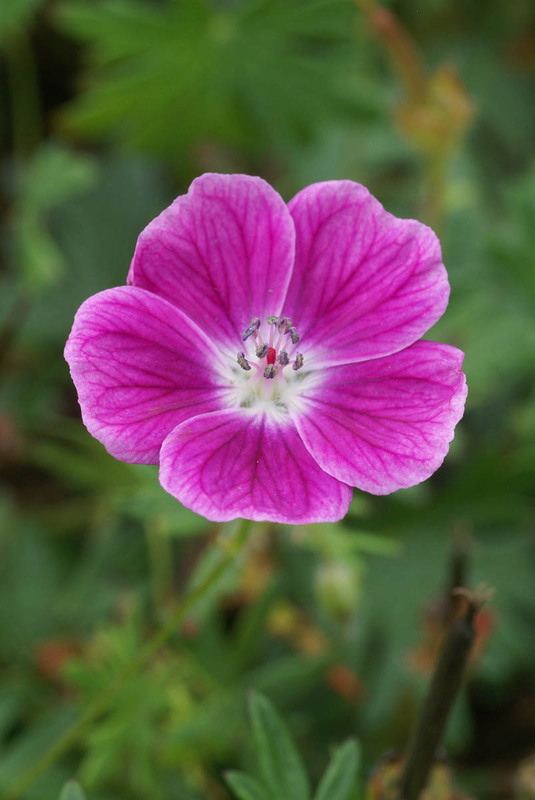 Geranium have flowers with 5 more or less identical petals, usually arranged in a flat or bowl shaped. Pelargonium also have 5 petals but they are arranged 2 above and 3 below. 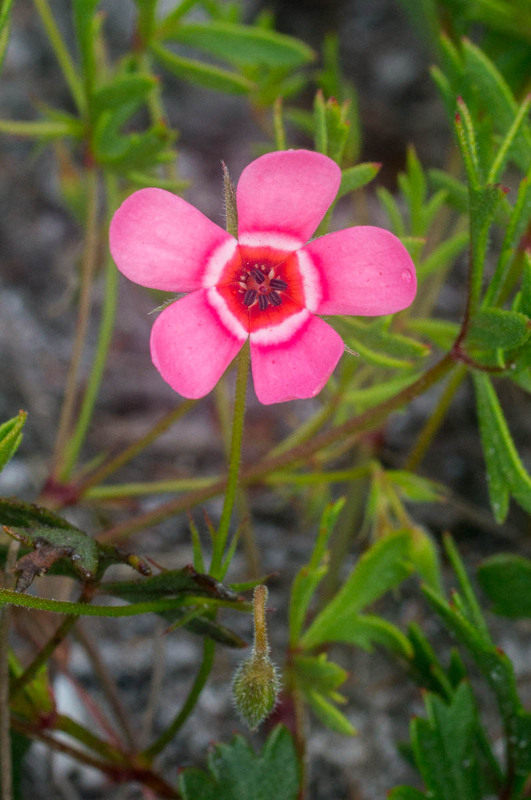 The 2 upper petals are usually larger and broader than the lower 3 (indeed in some species the lower 3 are even missing). So Geranium flowers have radially symmetric flowers (actinomorphic), whereas Pelargonium flowers have a single plane of symmetry (zygomorphic). 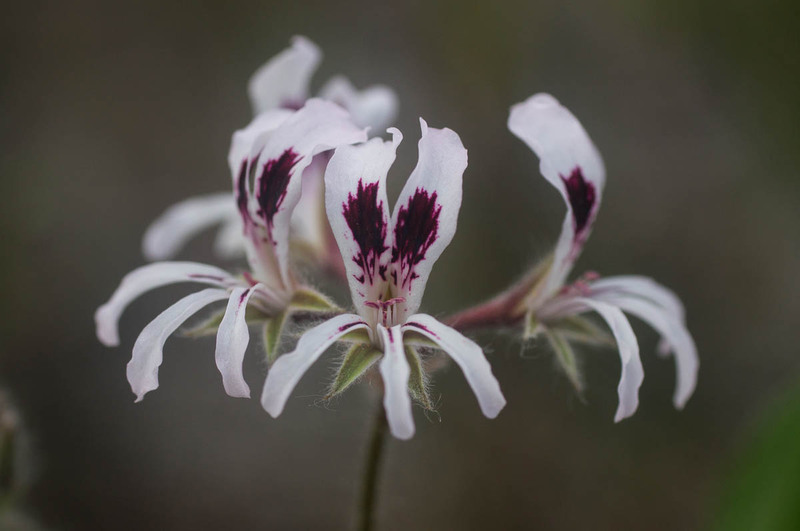 This brings us onto Pelargonium incarnatum, which grows here at Phillipskop. In almost every genus there is one species that refuses to obey the rules. This species of Pelargonium has perfectly radially symmetric flower. So how do we know this is a Pelargonium and not a Geranium (for there are a number of true Geranium species that grow in South Africa)? One way is to count the stamens. True Geranium will have 10 fertile stamens (have anthers with pollen) whereas Pelargonium will always have 7 or fewer. The remaining stamens in Pelargonium are modified in some way but always lack an anther. In Pelargonium incarnatum one can clearly see just 5 fertile stamens. 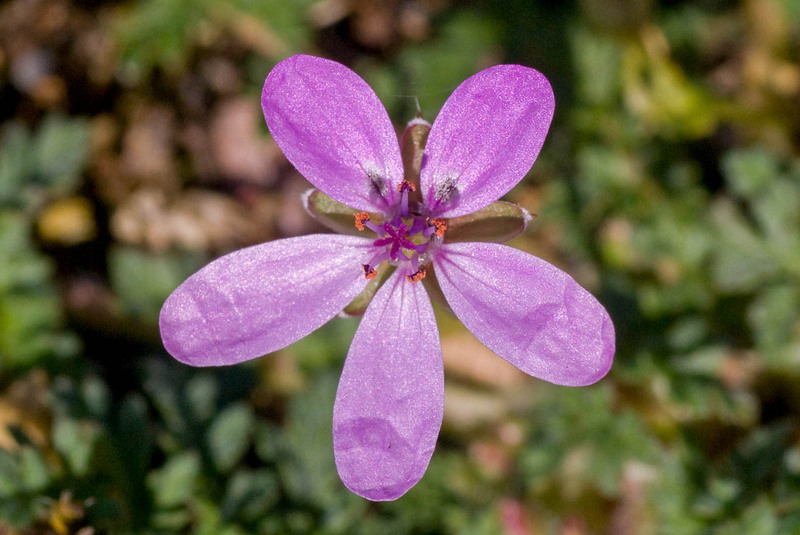 Unfortunately, radially symmetric flowers with 5 stamens is the best way of identifying the genus Erodium from Geranium, so for a long time Pelargonium incarnatum was thought to be the only native South African representative of the genus Erodium (though there are a couple of widespread introduced species). However, when hybrids between Pelargonium incarnatum and Pelargonium patulum were detected, the species was more closely examined and minor differences such as the presence of a staminal column showed that it was indeed a Pelargonium, albeit a very unusual one. 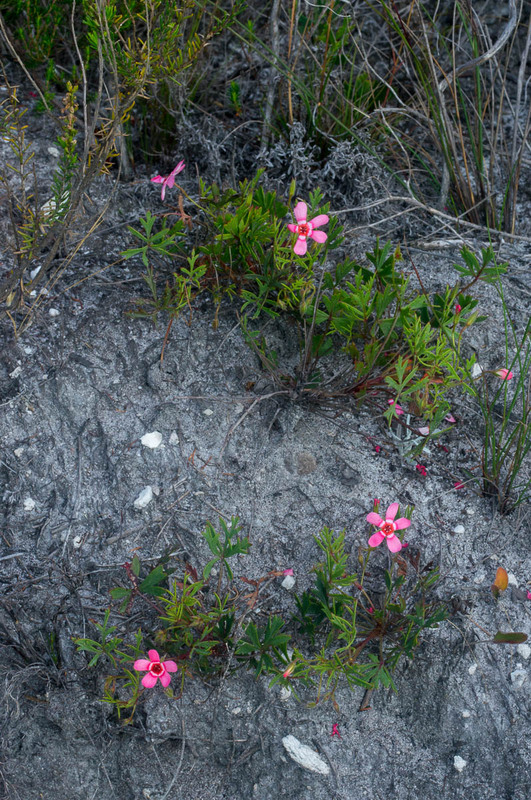 Here at Phillipskop, Pelargonium incarnatum grows in a couple of places on the dry lower slopes in loose stony soil but is never prolific or dominant. It flowers for a short season in November and early December. Although the individual flowers are beautiful with their alternating pale and dark concentric rings, it is not a vigorous enough plant to make a good show in the garden and is more suited to being grown in a pot where its beauty can be appreciated close to. December, Erodium, Geraniaceae, Geranium, November, Pelargonium, Pelargonium incarnatum, Spring. Bookmark.